The dairy industry provides 25% of New Zealand's export earnings and account for 33% of the world trade in dairy products. The shipment of milk to far-flung markets is most cost-effectively done in powder form, removing all the liquid and hence weight. Machine Vision has a small but important part to play in the important business of milk powder packing. In 2004 GEA Avapac, a specialist powder packing machine supplier and part of the global GEA group, was given a challenge: Fonterra, the largest dairy cooperative in NZ, wanted to jointly develop a solution to reduce or eliminate manual labour from packing rooms. For reasons of both labour savings and food hygiene it made sense to do this – and Fonterra were ready and willing to mount a “technology stretch” project to achieve the goal of what was termed “lights-out packing”. Milk processing is already heavily automated - from receiving the milk from the farm and turning it into powder in large driers, to high-speed precision metering of the powder into 25kg multi-layer plastic/paper dairy bags, to sealing and robotic palletizing of the bags. And, Avapac provide state-of-the art machines for most of the powder packing processes. However, one outstanding problem remained: how to retrieve empty 25kg dairy bags from a pallet and automatically feed them to the filling machine. The empty dairy bags are manually stacked onto pallets by the bag supplier, so their position on the pallet is always variable and not predictable. Machine vision guidance provided the answer to locating the bags, and while new to the dairy industry, ControlVision was able to demonstrate to Avapac how it was technology well-proven in the semiconductor, electronics, automotive and packaging industries since the 1980s. 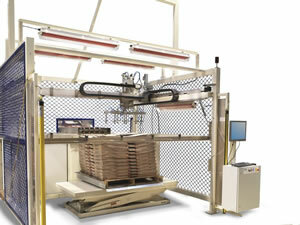 The Avapac solution for lights-out packing, the AVAPAC RBF1000, comprises a custom cartesian “de-stacker” robot fitted with a PC-based vision system supplied by ControlVision. 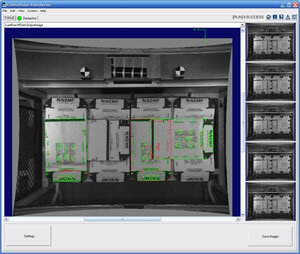 The vision system uses a Basler Firewire camera, Cognex VisionPro® software with PatMax® pattern recognition and ControlVision’s VisionServer™ application framework. This combination of vision components has produced the reliability demanded of a system expected to be 100% operable 24/7 without operator intervention. 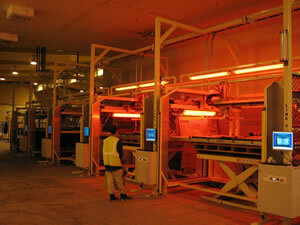 The RBF1000 system is now successfully exported world wide through the GEA group.